Set on the island of Nantucket, STARCROSSED tells the tale of Helen Hamilton, a young woman whose destiny is forever altered when she meets Lucas Delos and tries to kill him in front of her entire high school. Which is terribly inconvenient, not only because Lucas is the most beautiful boy on the island, but also because Helen is so achingly shy she suffers physical pain whenever she is given too much attention. Making matters worse, Helen is beginning to suspect she’s going crazy. Whenever she’s near Lucas or any member of his family she sees the ghostly apparitions of three women weeping bloody tears, and suffers the burden of an intense and irrational hate. She soon learns that she and Lucas are destined to play the leading roles in a Greek tragedy that the Three Fates insist on repeating over and over again throughout history. Like her namesake, Helen of Troy, she’s destined to start a war by falling in love. But even though Lucas and Helen can see their own star-crossed destiny, they’re still powerfully attracted to each other. Will they give up their personal happiness for the greater good, or risk it all to be together? I seem to always come across books that I doubt reading at first but then love after. So yeah it happened once again and boy did I love Starcrossed. Greek mythology? Just gotta love it and plus I haven't read many books like that so yay! When I say I was addicted to reading it, it's not an understatement. I don't know why. Probably everything about it was just so so awesome. Helen is great. She always had trouble in fitting in but that's what I like. She's different and she knows she is different. Not one of those typical teenagers. Like bleugh. And so when she discovers who she really is, it really is really cool. With that WOW ending I am just dying to read the next book. The Greek mythology makes it even better, very unique! 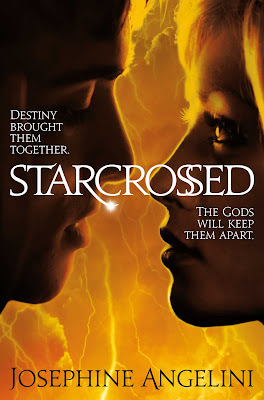 Starcrossed is an addictive, fast paced novel that YA readers will not forget!